Do you ever just stand in your kitchen and find yourself frustrated because things are not how they should be? You are always dripping water all over the floor while trying to load dishes into the dishwasher; or maybe every time you open the fridge it bangs into the pantry doors. I have gone so far as spilling a casserole dish while attempting the long treacherous trek between the preparation top (all the way across the kitchen) to the oven. If you catch yourself daydreaming about how your kitchen would look if you could re-design it, maybe it’s time. Take a moment to think about who in your family spends the majority of their time in the kitchen. Are they right or left-handed? When you purchase a refrigerator, you can often request for the handle to be on either side. If you don’t want a solely “left” or “right-handed” fridge, a French door refrigerator may be just the solution you’re looking for. Be mindful of surrounding details before making a final decision so as not to ram a perpendicular wall or block any doorways with your new fridge. If you’re installing a new stove, you won’t want this to block an entryway when opened, as that is an accident waiting to happen. 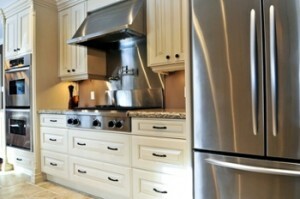 You also will want to avoid having a range or cooktop at the end of a cabinet run. When it comes to doing the dishes, it would make things easier for a lefty if the dishwasher were placed on the left side of the sink. As for the stove, perhaps the right-handed cook would like to have more drawer space on the right side of the stove, making it easier to grab utensils. It is important to think through all of the details before getting started on your kitchen remodel. You probably already have a place for all of your appliances, but that doesn’t necessarily mean that is the best area for them. Depending on your budget, you may be able to move things around to help with your kitchen flow.